The edible equivalent of a duvet day – these 4 Deliciously Creamy Dinners are perfect for whenever you feel in need of classic comfort food! Plus find the linky for #CookBlogShare Week 13. Hoorah! It’s finally spring 😀 I hope the weather is suitably spring-like where you are! Here in South East England the weather is positively glorious and looks set to stay like that for the foreseeable future – yay! I have been a busy little bee since last #CookBlogShare creating 3 new recipes on Easy Peasy Foodie. First up my Irish Lamb Stew and Easy White Soda Bread in honour of St Patricks Day, earlier this month. And then another fabulously easy midweek meal with a twist, my Easy Chicken Stroganoff. The twist being that this stroganoff is made with chicken rather than the usual pork or beef! Over on Productive Blogging I have also been busy, sharing some practical admin posts on 21 ways to spring clean your blog and How to keep track of your blogging income and expenses. I’ve also been continuing my love affair with all things SEO, sharing my tips on How to optimize your blog’s site structure for SEO as well as a post on 17 SEO mistakes to avoid in 2019! SEO is taking up rather a lot of my life at the moment as I have also been working hard on creating my SEO course. I’m pleased to announce that I have finally finished writing the first draft and I’ve uploaded most of it onto the course platform already. I still have quite a bit of behind the scenes work to do, but I am hoping to be ready to launch in May! Hands up who loves comfort food? Me, me, me! And this week I was most drawn to these 4 deliciously creamy dinners – perfect for when you need an edible hug! Only one of these recipes actually contains cream – the others are made creamy with bechamel style sauces. But all of them are wonderfully comforting and I just know they would all go down very well in this house! 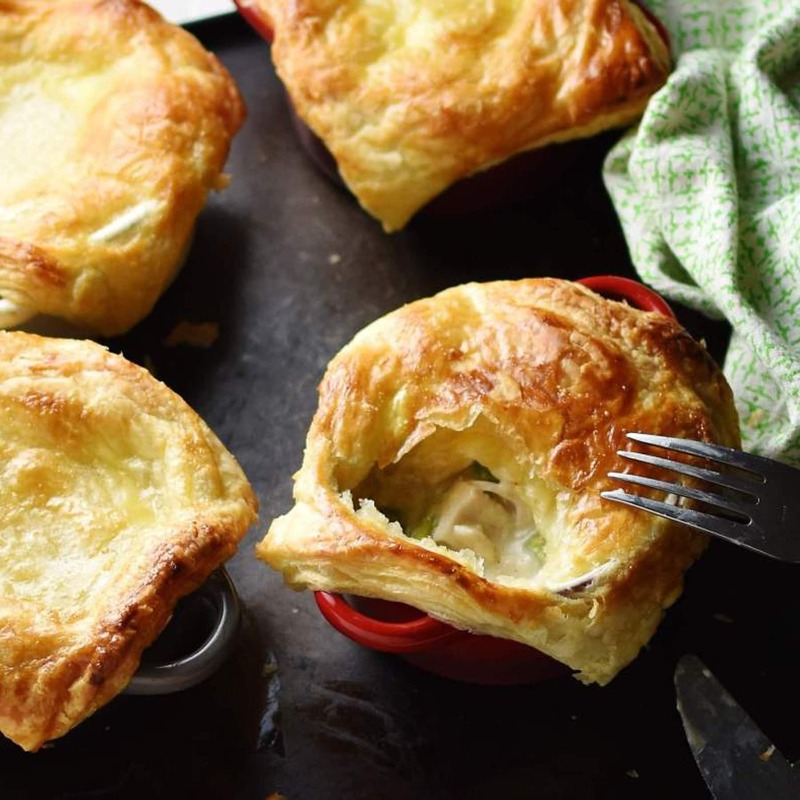 First up we have these gorgeous Mini Chicken Pot Pies from Monika at Everyday Healthy Recipes. Aren’t they just so cute! And I love the sound of the filling: chicken, asparagus and a wonderful bechamel sauce, pimped up with Dijon mustard, fromage frais and onion granules. All topped off with a delicious lid of crunchy, buttery puff pastry. It sounds so decadent, but actually, because this recipe is made with bechamel not cream, it’s much healthier than it sounds! Sticking with the bechamel theme, we move on to what I consider to be one of the most classic comfort food recipes of all time – Macaroni Cheese! 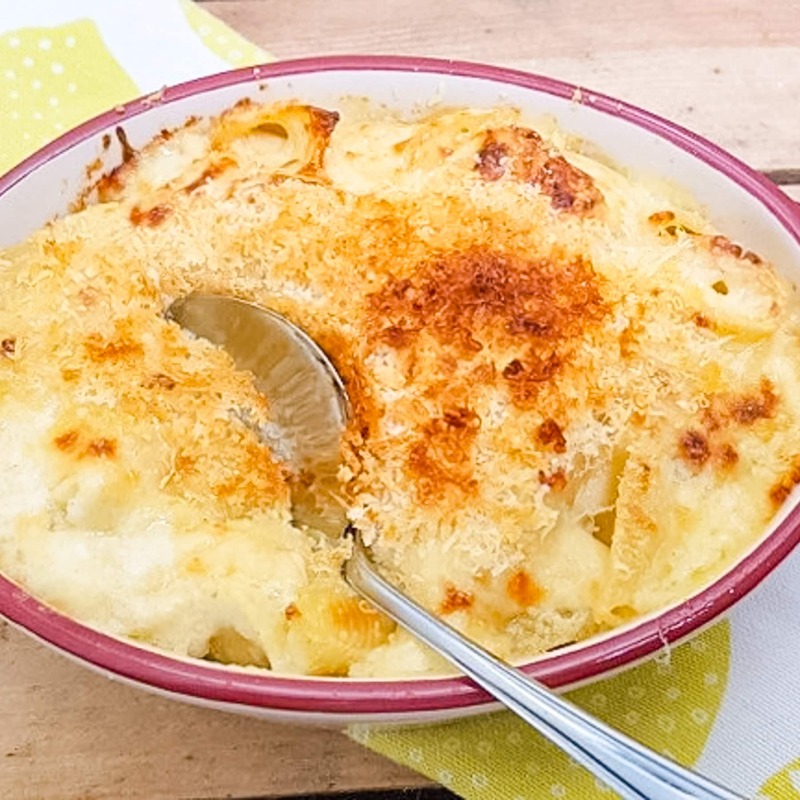 This fab recipe from Claire at She Eats is a bit of a twist on the traditional macaroni cheese recipe, though. Claire doesn’t use macaroni, but rather whatever pasta she has on hand, and will often put a handful of peas in too. But the thing I love about Claire’s recipe is she has used a mix traditional Lancashire cheeses in her version. I’ve often played around with the cheeses I use in macaroni cheese, but I’ve never tried using Lancashire cheese in my mac n cheese before. Now after reading Claire’s description, I really want to try it! 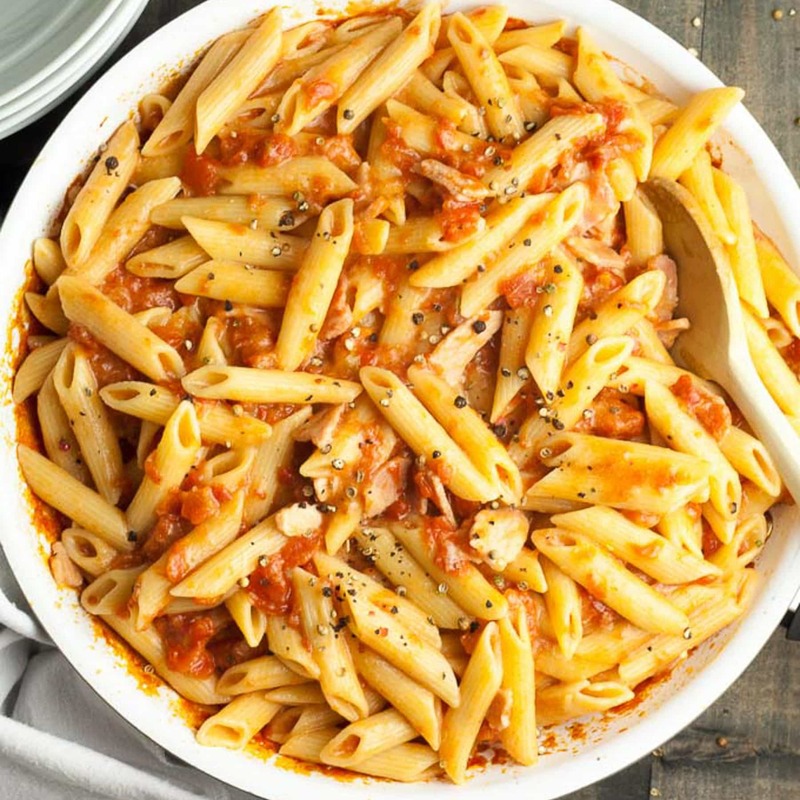 Another creamy, cheesy pasta dish, this Cheesy Bacon and Tomato Pasta from Anna at Once Upon A Food Blog is bound to be a winner. I know it would go down very well in this house! The sauce this time is made from a mix of tomatoes and lots of cheese, thickened with a touch of cornflour and flavoured with bacon! I particularly love that it’s ready in just 25 minutes – now that’s my kind of meal! The final ‘creamy’ recipe is the only one which actually contains cream! 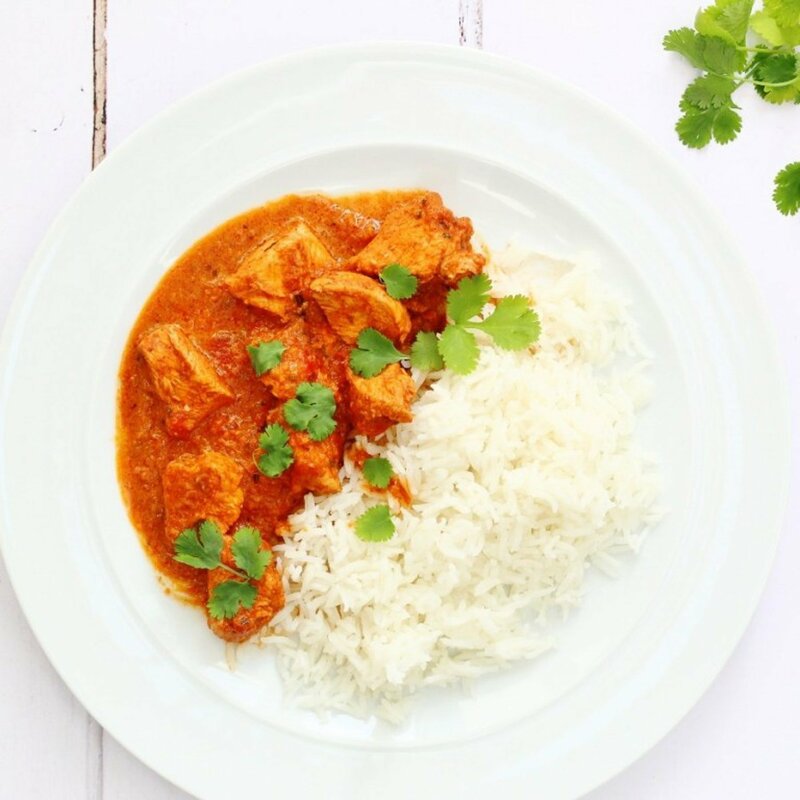 This delicious Chicken Makhani (AKA butter chicken) from Corina at Searching For Spice sounds so wonderful and comforting: warming spices, a rich tomatoey sauce, diced chicken breast and just a dash of double cream – a little bit decadent, but not too unhealthy! And ready in just 40 minutes. Perfect for a DIY curry night! If you wish, you can tweet a link to your recipe to me @easypeasyfoodie and also (if you have room on the tweet!) my co-hosts Jacqui @recipecrumbs and Monika @monikasecipes, using the #CookBlogShare hashtag and we will retweet them. You can also post your recipe on the Cook Blog Share Facebook Page. A pleasure, Corina – I do love a good chicken curry! Thank you for featuring my humble pies! And thanks for making them sound so delicious! Corina’s curry sounds gorgeous, even if it does contain cream (:0) I haven’t got a new recipe to link up yet so will be back when I’ve made one. A pleasure, Monika – I love your cute little pot pies! Note to self: don’t check out Eb’s round ups when you’ve skipped your lunch – I am soooooo hungry now. These all look amazing and I want you all to come and live with me and be my cooks. Please! These all look amazing – a creamy dinner is the best sort of dinner in my opinion! Keep those Productive Blogging posts coming Eb. Despite not having the time to do everything I’d like to, I’ve learnt a lot and made huge progress. Thank you. Great round up! I too fell in love with Monika’s cute pies and Cheesy Tomato Pasta from Anna. thanks for hosting. Creamy pasta dishes are my absolute weakness, so I’m loving this round up Eb!! That butter chicken looks absolutely delicious too! I’ve been under the weather, so these dishes are exactly what the doctor ordered! Here in Southern Wisconsin, the trees are only just beginning to bud out and the night temperatures still dip into the low 30s. But yesterday was opening day for baseball, which is always a welcome sign that Spring is finally here. In honor of the occasion, I’m sharing an updated post with my Ultimate Chili Cheese Dogs, which badly needed a makeover (now re-photographed and re-SEO’d!). Thanks for hosting and for always being an inspiration, Eb! Another great choice for a round up Eb. Thanks for featuring my Cheesy Bacon and Tomato Pasta Eb. All the dishes look gorgeous. I’m really hungry and could totally demolish Claire’s Macaroni Cheese right now!